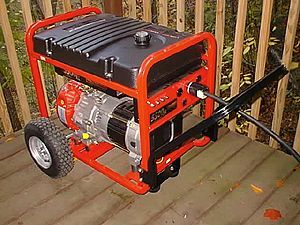 Almost every American owns at least one of these engines in cars, lawn mowers, weed whackers, and now the portable home generators. They are spark ignited two and four-cycle engines. Two-cycle engines produce twice the power from a given size, but consume more fuel and require oil mixed in with gasoline. Four-cycle engines dominate the generator business. Emergency Generator Gasoline is the primary fuel for residential generators, but the same engine can be set up to burn propane, LP gas, and natural gas. However, the engine carburetor and spark timing must be set with the specific fuel in mind. In addition, running these engines on natural gas reduces their peak kW capability, making the natural gas engine choice more expensive to purchase than other fuels. This is why natural gas engines typically cost between $150-$250 per kW more than other spark ignited engine options (Check out Generac's online catalog for final price comparisons). In addition, natural gas engines are less efficient than the same engine fueled on any other commercial fuel choice. The primary advantages of these engines are that they are relatively inexpensive to install and you can find maintenance almost anywhere in the US. For example, a typical 6 kW residential model can be purchased and professionally installed for about $2,000 including a manual transfer switch. Automatic transfer switches to operate the generator even when no one is home can double the cost of smaller units. A good rule of thumb is that the total cost for gasoline-fueled generators is $350-$400 per kW (or less). Gasoline fuel does have a relatively short shelf life, and has a relatively high potential fire hazard due to the relatively low flash point and flammability of gasoline. Always follow manufacturer recommendations. Adding "stabilizers" to the fuel tank can extend shelf life. And always be concerned about carbon monoxide emissions from these engines. They should not be operated in a garage or in any area without adequate ventilation. There are also local environmental restrictions on their operation and use in certain areas of the country. Another factor to keep in mind is the noise level in suburban settings.